Enjoy our monthly Blog & Newsletter with important Technology and Tech Tidbits for your online marketing from PTC Computer Solutions. 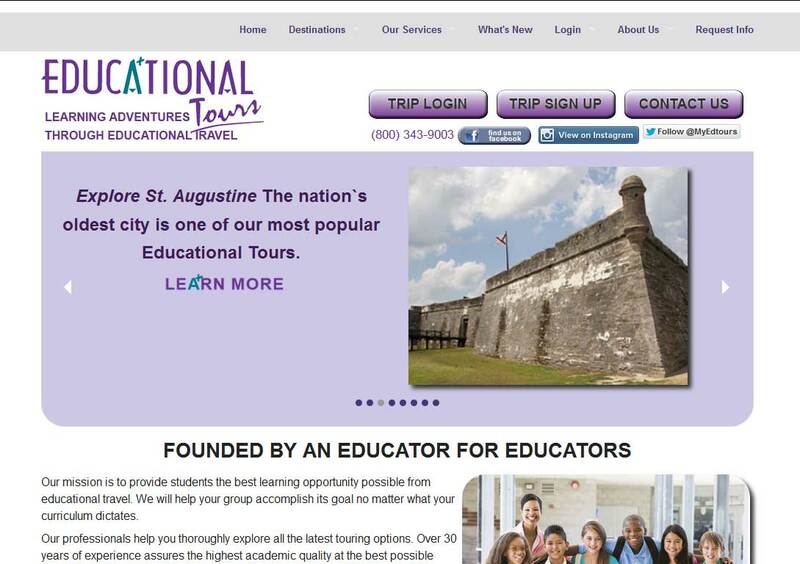 DESCRIPTION: The Educational Tours website was designed by REDdot Marketing and developed by PTC Computer solutions. The Educational Tours mission is to provide students the best learning opportunity possible from educational travel. Educational Tours will help your group accomplish its goal no matter what your curriculum dictates. You can find out more by going directly to their personal website, www.myedtours.com, or contact them directly at info@myedtours.com or (800) 343-9003. Thanks for letting me know about Educational Tours. Where can I find the best Educational Tours? Right here. My children learned so much from joining your Educational Tours. Your style is so unique in comparison to other people I’ve read stuff from. Thank you for posting when you’ve got the opportunity, Guess I will just book mark this site. When we needed to develop a web presence to congregate and assemble our Educational Tours online, PTC Computer Solutions was willing to step forward and help us out with an incredible understanding of web database development through MySQL and SQL queries and PHP development as well as working with our existing ASP and ASP.NET development. They were able to set up our backend administrative layer so we could handle online bill payments with an ecommerce solution integrating PayLeap and tremendous programming skills. We are based in Florida but not in Jacksonville, but they had no problem working with us through personal meetings and remote services. They are the best Jacksonville, Florida based website design and development company and have been in Jacksonville longer than any other existing company. They know the Internet, computer programming, website design and how to set up a website as well as how to generate buzz and Search Engine awareness through social networking and other online marketing means. Contact PTC Computer Solutions at info@ptccomputersolutions.com if you are interested in your own quality website design.